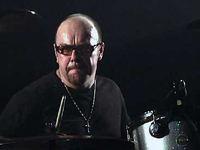 Jason Bonham was born July 16, 1966 to Led Zeppelin‘s John Bonham. A lot of talented children have probably been asked by a parent to entertain family and friends, maybe in the living room, maybe sing a little, play an instrument. No big deal and a good way to get used to performing for others. But when Jason Bonham was a small child and got called in to entertain, the family friends he played his drums for could be anyone from Jimmy Page to some of the guys from the group Bad Company. That’s what happens when your father is drummer John Bonham, one of the original members of the legendary rock band Led Zeppelin. At the age of only five, Jason could play the drums, at least a scaled-down set of them, with skill. When he was 17 he was a member of the band Air Race. The group signed a record contract with Atlantic, recorded one album, and opened for big names like Queen, Meat Loaf, Ted Nugent, and AC/DC. John Bonham died in 1980, but Jason, who has marked a few places in music history himself, has stepped in from time to time to help keep his father’s memory alive. In 1988, Jason took his father’s spot in the televised, first-ever Led Zeppelin reunion, which included Robert Plant, Jimmy Page, and John Paul Jones. He went on to tour with Page and to record the album Outrider with him. Bonham teamed up with greats like Paul Rodgers, Slash, David Gilmour, Jeff Beck, and others in 1993 to work on a tribute to Muddy Waters. The album’s success brought a nomination for a Grammy Award. A year later, Bonham, along with Rodgers and Slash, appeared at the memorable Woodstock II. That same year, Bonham helped form a group known as Motherland and released another album, Peace 4 Me. In 1995, when the members of Led Zeppelin were inducted into the Rock & Roll Hall of Fame, Bonham, standing in his father’s place, once again performed with Jones, Page, and Plant. 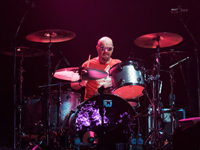 In between session gigs, Bonham put time and effort into another band of his own, the Jason Bonham Band. Other members are bassist and keyboardist John Smithson, guitarist Tony Catania, and vocalist Chas West. The band has toured nationwide, playing a lot of old Zeppelin numbers, along with new works. In 1997, the Jason Bonham Band album When You See the Sun was released under the Sony Records label. In the Name of My Father: The Zepset Live from Electric Lady Land was released the same year. The tracks on this album are flavored just right for Led Zeppelin fans. Profits made from the release go to the John Bonham Memorial Motorcycle Camp for Kids. Jason is currently the drummer for Foreigner.